From director Ron Howard, Solo: A Star Wars Story blasts onto our screens starring Hail Caesar’s Alden Ehrenreich as the young man who was to become everyone’s favourite space cowboy. But does it jump into hyperspace or do we have a bad feeling about this? Ever wondered how Han got the name Solo? Ever wanted to know how he made the Kessel run in under twelve parsecs? How did Han meet Chewbacca? Lando Calrissian? And how did he get the Millennium Falcon? If your answer to these questions is “yes”, then Solo is definitely for you. Young Han (Ehrenreich) is a kind of Oliver Twist figure, a grinning scamp who nicks stuff and dreams of escaping a refinery planet called Corellia. Within the first ten minutes there’s a fight, a chase and Han escapes, but only by being separated from his young love Qi’ra (Game of Thrones star Emilia Clarke). Han joins the Imperial Service to become a pilot, but is demoted into the infantry for insubordination and finds himself in the deep mud of a remote planet – which actually looks quite good before the non-stop narrative rush moves us on. 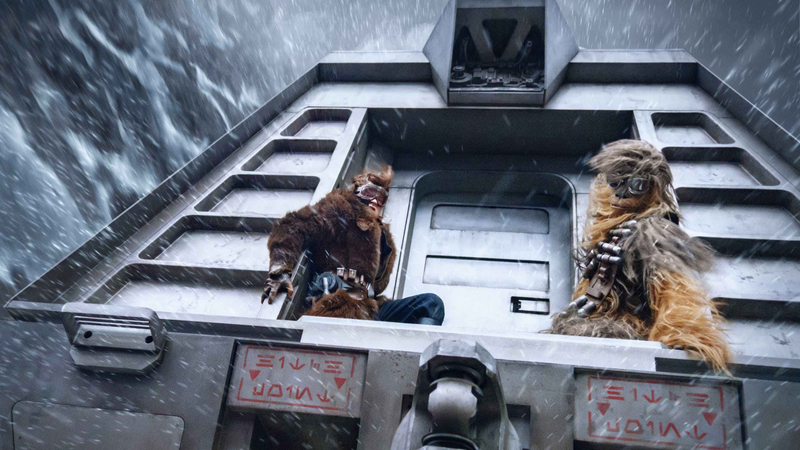 The next thing we know, Han has befriended Chewbacca (Joonas Suotamo) and fallen in with a gang of outlaws led by Becket (Woody Harrelson) and Val (Thandie Newton). Having left the mud planet, we’re thrown into the heist of a roller-coaster train in the mountains. Howard keeps everything moving at a whip, as if he wants to finish the film under twelve parsecs. But speed paradoxically doesn’t make for excitement. Too much breathlessness and we simply suffocate. The CGI has the gravity-defying weightlessness that removes jeopardy from the sequences and although there are some deaths early on, there’s so little time to get to know the characters, it’s hard to care. It doesn’t seem to have any impact on the other characters either. Never mind – we’re off to another planet with villainous Dryden Vos (Paul Bettany) and another caper is afoot. Here, Han is reunited with Qi’ra and meets up with a comedy robot (Phoebe Waller-Bridge) and Donald Glover’s Lando, who proceeds to steal the film as handily as he cheats at cards. This more comic second half is far better than its predecessor, finding its pace and including some of the best gags. But too much of the film feels like a page of Wookiepedia, dramatised. Joining all the dots and setting up the Boba Fett spin-off makes this Star Wars story much more like a lesser Marvel film, and the cinematography is similarly muddy and undistinguished. There’s nary a memorable shot in the whole film. As for Ehrenreich’s performance, it’s honestly difficult to tell how good he is. Remarkably for a film called Solo, with so many characters each one nibbling at the scenes, he hardly has room to shine. Ultimately, Solo: A Star Wars Story proves that, like the old chestnut “Who shot first?”, some questions are best left unanswered.